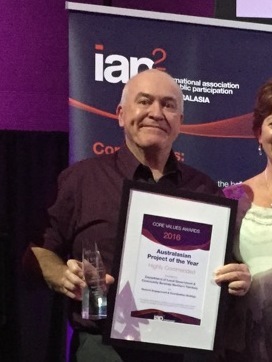 The Remote Engagement and Coordination Strategy (RECS) has been awarded the Indigenous Award in the 2016 International Association for Public Participation (IAP2) Australasia Core Values Awards. The strategy, developed by the Department of Housing and Community Development (DHCD), aims to change the behaviour of visitors to remote communities through a common engagement and coordination framework. RECS promotes the importance of capturing and acting on community feedback, and reducing the burden of engagement on remote community members by avoiding duplication and unnecessary consultation. It also provides practical tips and tools to build the capacity of staff to better engage with community decision-makers. The strategy is based heavily on IAP2’s internationally recognised engagement methodology and DHCD partners with IAP2 in the delivery of training to Northern Territory public servants in all regional centres. The Core Values Awards were created to encourage excellence, quality and innovation in public participation. They recognise and encourage projects that demonstrate leading practice and organisations that are at the forefront of public participation.